SRMJEEE 2018 Application Form has been released and can be submitted until April 12, 2018. Now the Application process is over. The registered candidates can then book their slots from April 09, 2018 onwards. The slot booking is to be done online at, srmuniv.ac.in. Admission to B.Tech program at SRM University, SRM University AP – Amaravati, SRM University Haryana – Sonepat is on basis of SRMJEEE 2018 exam. Get here complete details of SRMJEEE 2018 such as exam dates, application form, slot booking, admit card, result. Latest: SRM University has been released a notification regarding 2nd counselling dates. Candidates can check the same below. SRM University is conducting SRMJEEE 2018 at 117 cities in India. It is now compulsory to have Aadhaar card in order to apply. 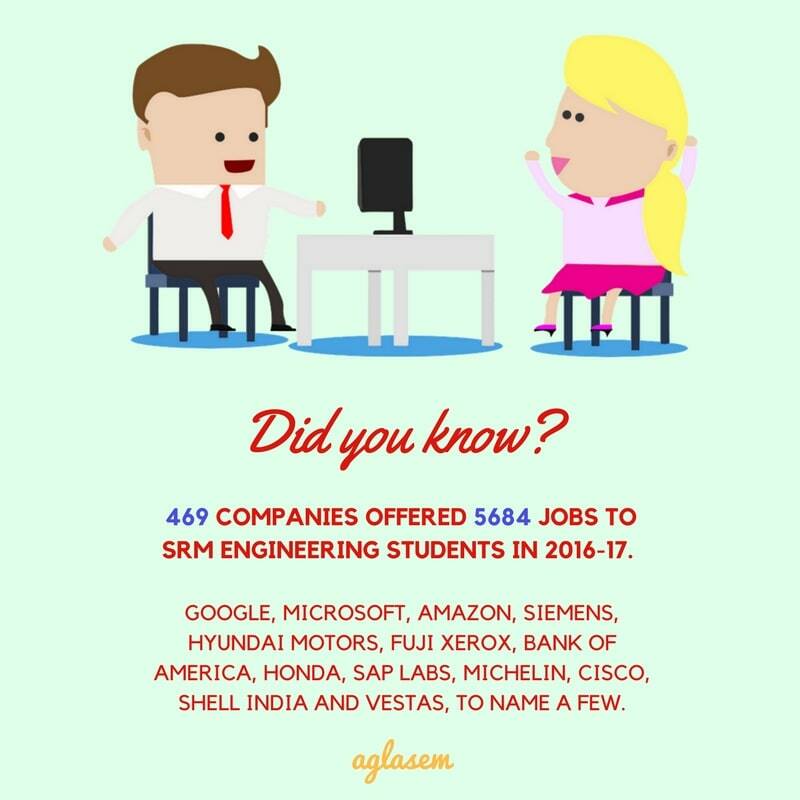 Those who have applied will get various instructions regarding the exam and admissions from SRM University on email ID / SMS from time to time. It is critical to ensure that you submit application form of SRMJEEE 2018 on time. Therefore, if you have not yet applied, apply now. Candidates who fulfill eligibility criteria can proceed to fill online application form. 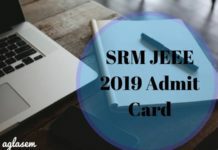 SRMJEEE 2018 Application Form was released in November. Candidates must submit application forms as per schedule given above. Those who apply offline must ensure that their form is sent on such a date that it reaches authorities before the last date. Email ID entered during registration for SRMJEEE 2018 shall be final and cannot be changed at any stage. You have to apply by entering name, email ID, mobile number, and password of their choice. Then you can fill personal details, course preferences, academic details. After that, you have to upload passport size photograph, signature, class 10th mark sheet, Aadhaar card. Then you can pay the application fee. The application fee is Rs 1100. All applicants need to book test slot and date online. Slot booking for SRMJEEE 2018 will be online. 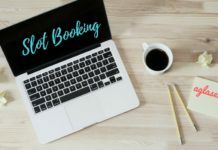 How to book test slot? In order to book a slot, you will log in at srmuniv.ac.in (SRMJEEE login page). You will need to enter email ID and password to log in. During SRMJEEE 2018 Slot Booking you will select a date on which you wish to appear for the exam. Dates of the exam are 16th to 30th April 2018. You will also select slot of the exam from available test slots. Upon booking test slot, you can download hall ticket. It is compulsory to present SRMJEEE Admit Card along with Aadhar card to get entry to the exam centre. Authorities will scan hall ticket, capture photograph, and assign computer at the test centre. You will get SRMJEEE 2018 Hall Ticket only if you have filled and submitted the application form on time. It contains name, photograph and address of the candidate, the address of the Test Centre allotted and test schedule. After receiving admit card, you should check that all details in it are correct. If there is an error, then you should bring it to the notice of the authorities. 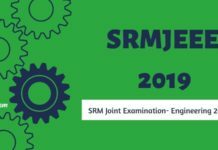 Know exam pattern of SRMJEEE 2018 to prepare for it. The complete pattern of examination has been provided by SRM University. Mode: SRM University will hold SRMJEEE 2018 as a computer-based test on all dates. Type of Questions: All questions will be multiple choice questions. This means that each question will have options as answers, out of which, you have to select the correct option as an answer. Number of Questions: There will be 35 questions in Physics, 35 questions in Chemistry, and 35 questions in Mathematics / Biology. An overall number of questions in SRMJEEE is 105. Marking scheme: Each correct answer fetches 3 marks. Maximum marks: Maximum marks that can be obtained in SRMJEEE is 315. The language of questions: All questions will be set in English only. SRM Joint Engineering Entrance Exam will have questions from the syllabus prescribed by SRM University. A specific syllabus has been provided so that candidates can prepare for the exam. There are 10 units in Physics, 16 units in Chemistry, 10 units in Mathematics, 13 units in Biology. You can download complete syllabus here. Download SRMJEEE 2018 Syllabus: Complete syllabus of SRMJEEE 2018 has been released. Click here to download it. How to prepare for SRMJEEE 2018? You can prepare for SRMJEEE 2018 simultaneously with your preparations for other engineering entrance exams. Most of the syllabus is common with IIT JEE. Apart from studying syllabus of IIT JEE, you should specifically take a look at SRMJEEE Syllabus. Make sure to cover all topics of Physics, Chemistry, Mathematics from the official syllabus. Practice multiple choice questions from such books that provide medium-difficult questions on 10+2 level PCM. Attempt mock tests of SRMJEEE. SRM University ha been announced the result of SRMJEEE 2018 at srmuniv.ac.in. Key details regarding declaration of the result are as follows. The result has been announced online as per schedule. Merit list will be prepared based on the performance of candidates in SRMJEEE 2018. Candidates can check result through login at the website. You will also get a result on email. The university published the details of counselling along with the result. There will be common counselling for admission to SRM Group of Universities viz., SRM University, SRM University AP – Amaravati and SRM University Haryana – Sonepat. 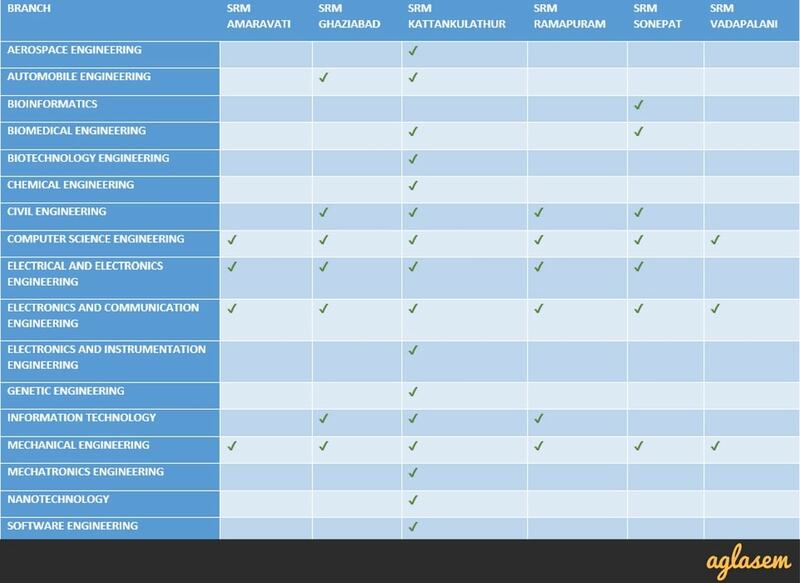 The following is an indicative list of B.Tech courses of SRM University. Candidates must, therefore, confirm the same at the time of counselling. Know eligibility criteria for SRMJEEE 2018 / SRM University Admission 2018. You should apply only if you fulfill all these conditions. Age: Candidate must have been born between July 1, 1997 and July 1, 2002. Nationality: Candidate should be Indian resident / NRIs and holders of PIO or OCI. Those who are NRls and holders of PIO / OCI card and get admission to SRM University through SRMJEEE will get a prescribed scholarship on international tuition fees. Qualifying Exam: Candidate should have either passed 10+2 or is appearing in it. He/she should have studied Physics, Chemistry, Mathematics / Biology / Botany & Zoology / Biotechnology as major subjects. In addition, studies must have been full-time stream from any State Board, CBSE, ISCE, Matriculation, or NIOS. IB candidates: International Baccalaureate (IB) with Diploma, or an A-level with Physics, Chemistry and Mathematics / Biology / Botany & Zoology / Biotechnology as major subjects from any international school. NIOS candidates: Only those who have studied class 10th as well as class 12th, both, from NIOS, are ineligible for SRM University B.Tech Admission. Number of seats available in SRM University is around 7000, as per reports. The application fee is different for each campus and each branch. Fee for SRM IST Chennai, SRM University – AP Amaravati, SRM University – Delhi NCR Sonepat are as follows. SRM University has collaborations with 105 universities in 20 countries. This includes University of California, Berkley, Carnegie Mellon, Delft, Warwick, Wisconsin-Milwaukee. This enables B.Tech students to study a semester abroad. SRM University has 4-star QS world rating. It also has NAAC A grade. SRM University is in MHRD A category. To know more about SRMJEEE 2018, download SRMJEEE 2018 information brochure.